Light and breezy Viscose Top Lennox with custom designed pastel dot pattern and bow detail. 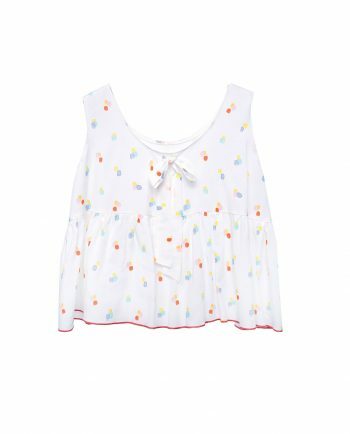 A perfect summer top that reminds of yummy gelatos. Delicious pastel gelato inspired dot pattern, classic PJ cut and contrasting piping. Viscose PJ Top Lennox is summery, elegant and fun. Long skirts are always on trend! Easy to mix and match Viscose Skirt Mary is the ultimate skirt of this season. Gorgeous dotted pattern in fall colours. Long skirts are always on trend! Easy to mix and match Viscose Skirt Lottie Green is the ultimate skirt of this season. Gorgeous dotted pattern in fall colours. Enjoy fall with this gorgeous dotted Viscose Blouse Lottie Purple! Softest viscose, loose fit, and full sleeves are accentuated with a delicate lace ribbon. Button fastening on the back. 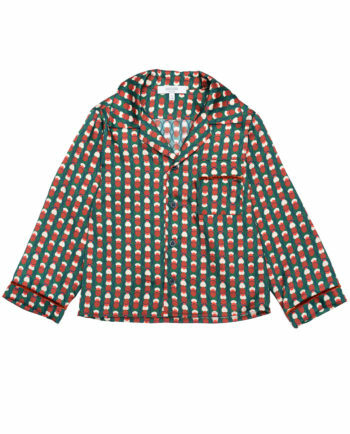 Be trendy with our PJ Jacket Lottie Green! 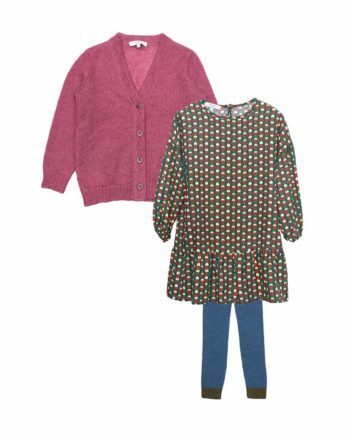 The gorgeous dotted pattern in fall tones is embellished with soft velvet detailing. PJ style blouse to pair with our PJ pants or combine with a skirt. 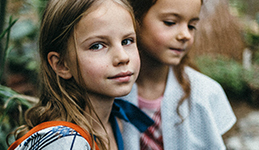 Ease and comfort, the loose fit and a full sleeve make Viscose Tunic Lottie Green perfect for girls of any age. Made from soft viscose in a jolly dotted print and accentuated with a delicate lace ribbon. Button fastening on the back. 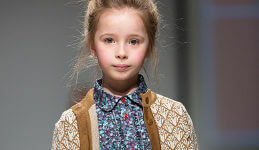 Ease and comfort, the loose fit and a full sleeve make Viscose Tunic Lottie Purple perfect for girls of any age. Made from soft viscose in a jolly dotted print and accentuated with a delicate lace ribbon. Button fastening on the back. Loose, dot patterned viscose Blouse Lola Pidgeon to pair with a favourite pair of trousers or a skirt. Loose, dot patterned viscose Blouse Lola Mustard to pair with a favourite pair of trousers or a skirt. Loose, dot patterned viscose Blouse Lola Plum to pair with a favourite pair of trousers or a skirt. Soft and so comfortable, Jersey Dress Calvatia Burgundy with pockets and pleated detail on skirt. Light viscose Dress Lola Pidgeon adds a bit of romance and sweetness to an everyday look. Delicate frills, button fastening and flared sleeves. 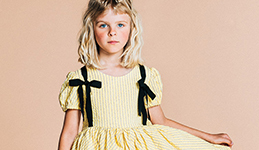 Light viscose Dress Lola Mustard adds a bit of romance and sweetness to an everyday look. Delicate frills, button fastening and flared sleeves. Light viscose Dress Lola Plum adds a bit of romance and sweetness to an everyday look. 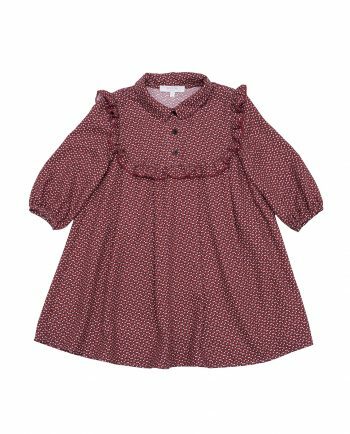 Delicate frills, button fastening and flared sleeves.